An illustration for "Eat," a literary and photography exhibit about relationships with food. But researchers say that mindful eating --choosing quality over quantity and savoring your meals instead of, say, plowing through another pint of Ben & Jerry’s while watching “Westworld” -- can make a difference. That’s especially important because the Ohio Valley has a serious problem. 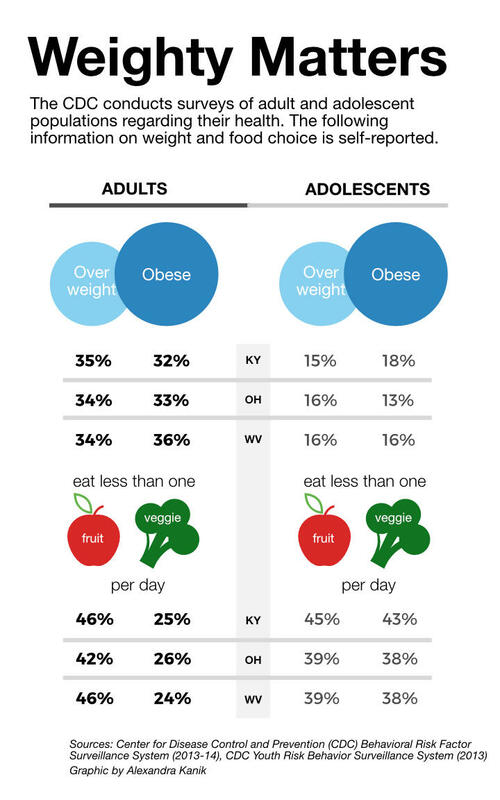 In Ohio more than a quarter of adults are obese. In Kentucky it’s about a third. And in West Virginia, it’s even higher. 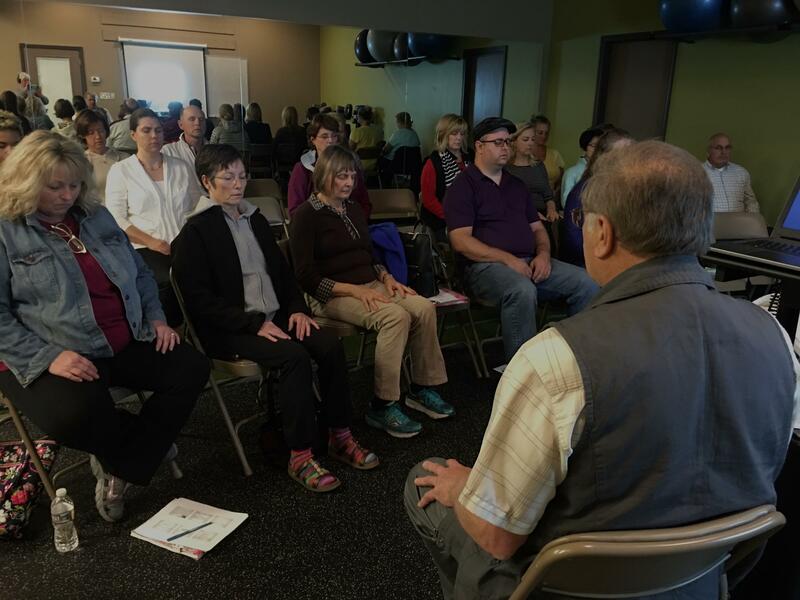 “For this exercise let’s just go ahead and close our eyes.” University of Kentucky Professor Dr. Geza Bruckner starts his class on Mindful Eating at Lexington Healing Arts. There are about 20 people in the class, mostly middle aged women, although there are a few men and, as might be expected, some Birkenstocks are in view. The strain shows on their faces as they try to clear their heads and do what should come naturally: breathe. Supper commences when six o’clock tolls. Fruit and mint juleps in clear crystal glasses. Read the rest of Don Fleming’s Gather here. A health sciences researcher who studies things like the impact of probiotics on gut health, Bruckner has practiced mindfulness for decades and knows it can be powerful. Dr. Geza Bruckner’s class on mindful eating. But, he said, it does take practice and discipline to stay on the right path. Kristeller said mindfulness applied to healthy eating has the same overall results as a diet when it comes to losing weight. But she said mindful eating has been found to also have benefits such as lowering the blood glucose levels of diabetics and reducing stress that can cause health issues such as high blood pressure. Kristeller, who is also author of The Joy of Half a Cookie, said it all starts with science. After a few bites of a new food our taste buds check out. Kristeller said it’s a chemical reaction that stops our taste buds but we keep on eating. We are “chasing the flavor,” she said, and it never works. How we eat also involves tradition, especially in places like Appalachia. As a therapist, she’s worked with folks who’ve known real hunger. “They are the first or second generation out of a family where people felt they didn’t really have enough to eat,” she said. Plus, she said, people cling to the eating patterns of their parents and grandparents. So those carb-laden, hearty meals that served generations of farm hands and people doing physical labor are now scarfed up by people working behind a desk. Plus now food is all around us and cheaper than ever. You might not be able to wrangle cash for a Cadillac but candy canes? They’re $1.39 for a box of 12 at Kroger. Kristeller said a mindful eater can change those patterns. Half a cookie can feel like enough. “If you really learn to tune in you won’t want the other half and that’s a huge shift,” Kristeller said. Sarah Jane Sanders spent months thinking about food and culture for “Eat,” a literary and photography exhibit on display at the Norton Center for the Arts in Danville, Kentucky, at Centre College. A baker’s dozen of written works were picked from some 200 submissions from around the world. Then Sanders, who’s based in a Frankfort, crafted images to match the words. 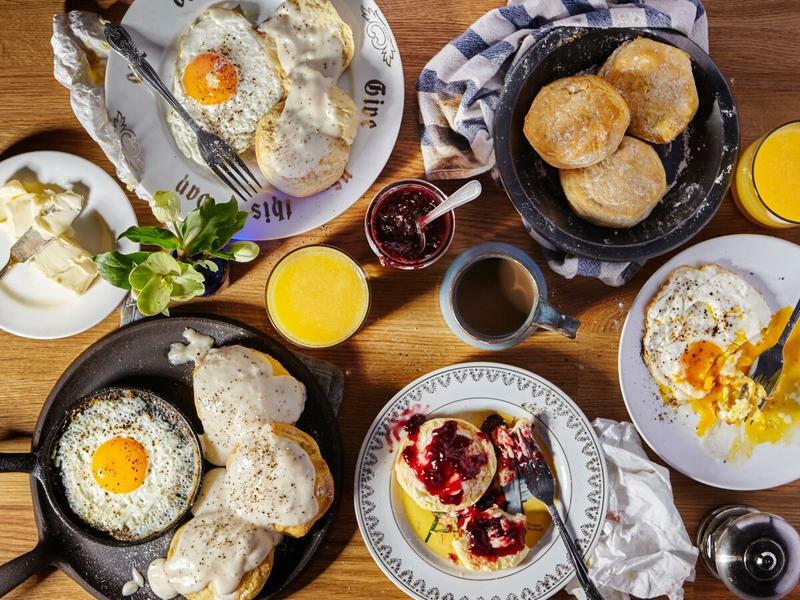 She found a consistent theme of food as a connection. It’s a connection she feels strongly as a new mom caring for her 8-month old son, Terran. She leaned and spoon fed Terran peaches, eggs and organic beef liver as we talked in her cozy cabin outside of Frankfort. The place has been in her husband’s family for generations. Read the rest of Bianca Spriggs’ She’s Hungry for Something But She Don’t Know What here. She learned a lot from working on “Eat” about how food brings people together. Her image for the poem “Gather” is a close-up of the hand of a farm worker fresh from the harvest. She said it represents the unseen work behind creating a family meal. Sanders said she thought for a week about how to visually represent the poem “She’s Hungry For Something But She Don’t Know What” by Afrilachian poet Bianca Spriggs. 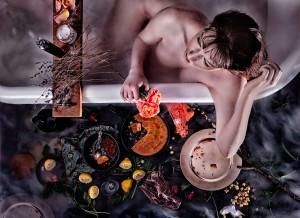 Her resulting creation offers a complex look at how women search to feed themselves emotionally and physically. An illustration Sarah Jane Sanders devised for the project "Eat." The work also gave Sanders new insight into food’s importance in her own life. 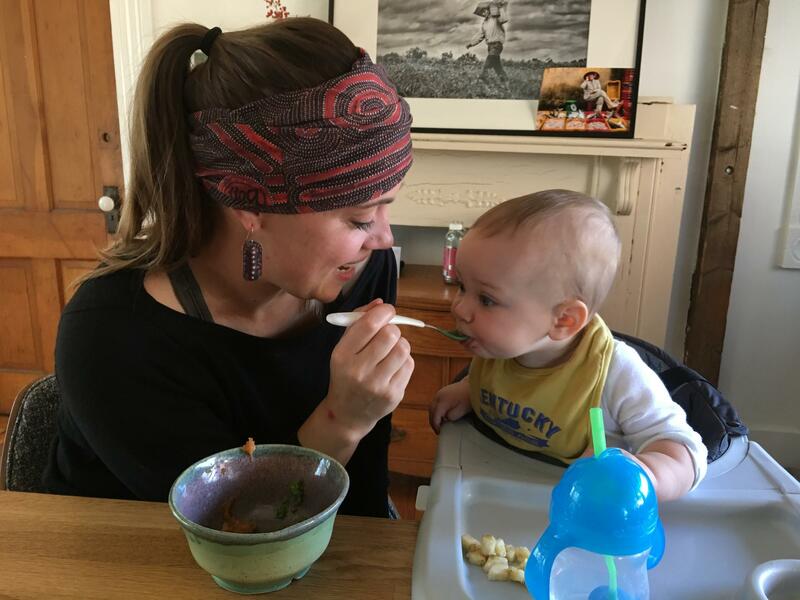 While her diet is now focused on locally grown, fresh food, she still has a soft spot for some comfort food that might seem odd for a mindful eater. An "Eat" image to match the poem, "The Taste of Blue." ​Imagining the taste of blue was the first memorable idea that challenged me to think about how the world could be if the possibilities were allowed to run free like my naked three-year-old sister who scared the Avon Lady at least once or twice before Momma had no more opportunities to buy Skin-So-Soft. And like my sister’s unorthodox greeting of strangers who dared to drive up our gravel drive-way, blue was my first taste of what could be, of what I could imagine. Read the rest of Michaella A. Thornton’s The Taste of Blue here. 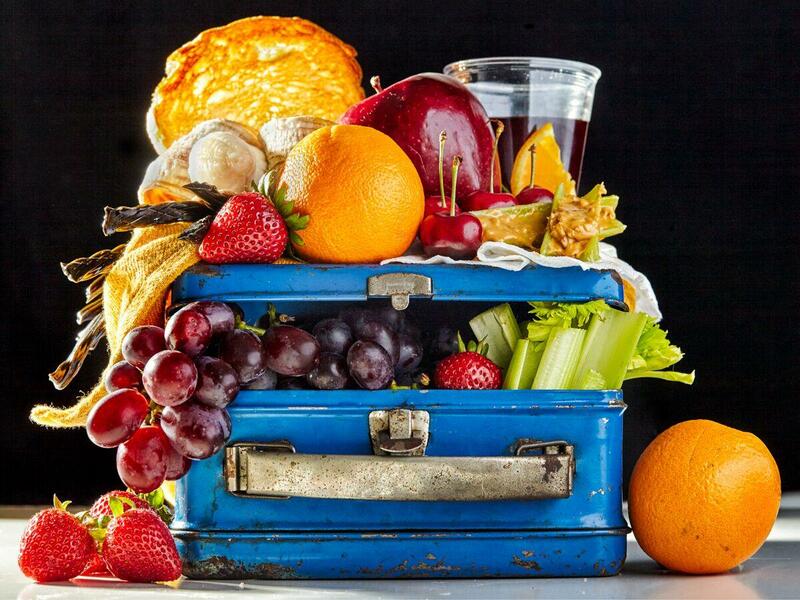 Changing your view of the food you eat and how you eat is all a part of being mindful. And Sander’s own evolution shows, we all have to start somewhere.